"Amendment 7 to B.A.I. Order 146." 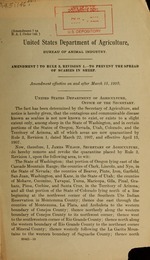 "Amendment effective on and after March 15, 1910." i .....:. .." : m : : : .." ": .... . ...i. ... :.. .
.. .. .. .. .. . :: ....i :L . ..! 0A.er:ard 15," ." 1 010.
. : l... .. .. ":i'.:. ii::il. . .:91:. . .... ...... . i+ +PA +! i!+ : . i. . .
:... ... ....e a i . .... $ N !i :;..... ..... .
i.: t t~ ++.,." .&. to. f of :A"HZ:" "" S"
...,.. ... .....,..... ....... ...,. ..... . . .. . ". .. .o.ut.h..n U .t. I.n..i.
of Custer County; thence following the southn-:. boundary of Custer County to its northeast corner; t:heni." the southern boundary of Fremont County to its southes4 . Railway to a point where it crosses the Kansas-Colorado state i..
_Witness my hand and the seal of the Dii .